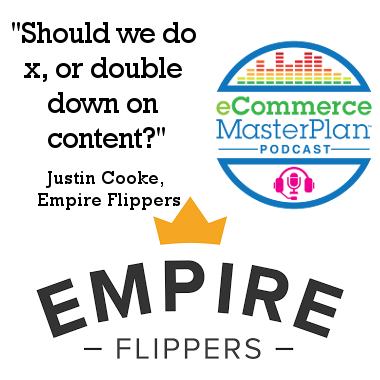 Justin Cooke is the CMO and founder of Empire Flippers. So as well knowing a whole heap about buying and selling eCommerce businesses, he also knows a ton about sales funnels and marketing automation. Empire Flippers launched in 2012 after they’d had 2 years successfully building and selling their own websites, and have now helped people buy and sell over $26million dollars worth of online businesses. Justin and his business partner had an outsourcing company in the Philippines. When their major client significantly cut back on their business, they began looking for other ways to keep their employees employed. They began building content-based sites and selling them off to investors. They didn’t know it at the time, but there was a market there. Others started following along and asking Justin to sell their websites, too, so eventually Justin and his partner turned their business into a brokerage. Empire Flippers helps people with eCommerce businesses navigate the process of exiting their business. They go through a vetting process to verify the business, then list it for sale on their marketplace, where their buyers can look at all the various businesses currently for sale. The prices range from $20-30 thousand to over a million dollars in terms of valuation. Empire Flippers will sell any type of online business, as long as it is profitable, has been around for over a year, and makes over $1,000 per month in profits. Businesses that are selling well right now are FBA, eCommerce, and dropshipping businesses. It varies with the trends — a couple years ago, people saw that FBA was hot and shifted their businesses to that. Now Amazon Merch is coming up, and people may shift to that. Listen to learn more about the Merch by Amazon business model. People tend to herd themselves around to different business models, chasing the next shiny new object, but it rarely has anything to do with the profitable or successful aspects of the model itself. The more successful business owners will find a model that they like and stick with it. Listen to learn why there are profitable businesses in boring industries, and how you can do really well with something you’re not passionate about. When buying or selling a FBA business, it’s best and easiest when the seller sells the seller account. Empire Flippers has a particular email that they send out to ask Amazon if they can include the account in the sale of the business, and Amazon has always allowed them to do it. They document that approval, then transfer the account to the buyer. The FBA can be sold without transferring the account, but it’s a slower process. It involves hijacking the listing and slowly transferring over the inventory. The best businesses have a strong brand and aren’t selling the same things as everyone else. The value itself is calculated by multiplying the net monthly average profit over the last twelve months by X, which is dependent on several things. Listen to learn Justin’s great explanation of the X variables, and how you can get a better multiple. The valuation may not remain static while the business is on the market. If the business does well and the price starts to go up, Empire Flippers can use that to their advantage by promising potential buyers the lower price if they buy it quickly. If the price starts to go down, they frame it as a discount to the buyers. The biggest problem with sellers is not selling at the right time. They may sell because they’re just done with it, have moved on to something else, or they have no time to devote to it. As a result, they may let the business dwindle, run out of inventory, and neglect to respond to customer inquiries. The seller must keep working on the business while it’s listed for sale. Listing a business isn’t the same as selling it — it’s still the seller’s responsibility until the money is in the bank. Listen to learn the six types of buyer profiles, and how the profiles have helped buyers find the right business for them. Listen to learn how tracking financials is incredibly beneficial even if the owner has no plans to sell. One of the worst things you can do is hop onto the latest business model and shift to each shiny new thing. Pick a business type and stick with it. Want even more ideas for growing your business in 2018? Then get over to our free Virtual Summit – it’s a set of over 30 videos, each presented by an eCommerce insider who will share with you a way you could grow your business. It’s free, and available right now.